I met 16-year-old Wyatt Boatright, his dad, Jimmy, and their good family friend, Nancy Benton, at our hunting lodge the afternoon of October 9, 2016. 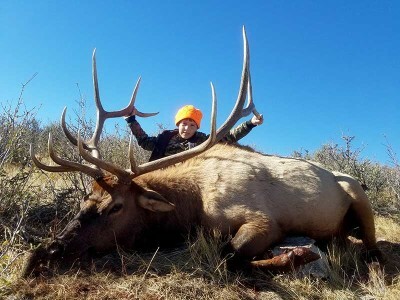 Wyatt was here to hunt elk with us to fulfill his dream through the Outdoor Dream Foundation. 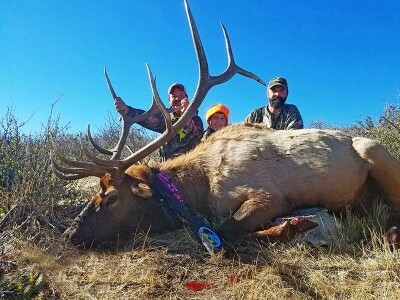 We’ve done many hunts with Brad Jones and the Outdoor Dream Foundation and have met some incredible and inspirational kids and family members. Wyatt, his dad, and Nancy were truly that. Wyatt was diagnosed with brain cancer when he was 10 years old. After finding a tumor on his brain, he underwent a crucial surgery to remove it. When Wyatt woke up from surgery, he had lost almost every function he had learned. He had to relearn basic life skills, such as how to walk, talk, eat, and drink. Atop that mountain of challenge, Wyatt’s chemo/radiation treatment damaged his pituitary gland to the point that his growth stopped. As a result, Wyatt is the size of a 10-year-old but has fought back to learn and regain most all of the functions he lost while in surgery. One thing he never lost was an incredible spirit and the will to succeed. Shortly after meeting Wyatt, we headed to our range to check his rifle. I knew he was focused as he checked his rifle on the 100-yard target, and after a few shots, we packed up and headed out to scout for the evening. 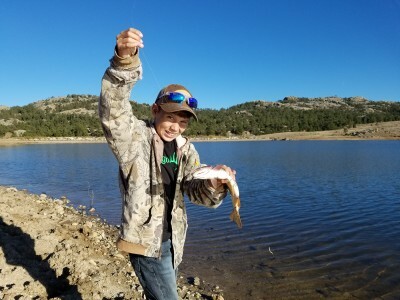 Wyatt was issued a disabled hunter permit from Wyoming Game and Fish, enabling him to hunt five days before the regular season opened. I was excited for Wyatt to hear his first bull elk bugle. We headed to a spot where I had been keeping track of a few bulls that were still rutting and herded up with cows. We spotted our elk shortly upon getting settled in to glass and watched them for an hour or so before they started heading down towards the still green meadows. Wyatt was so excited when I showed him the big herd bull on my Phone Skope that he said he couldn’t watch him any longer. As the elk got closer, the bugles were getting louder. It was going to be a long night for Wyatt. When I showed up for breakfast the next morning, Wyatt was the only one there. We ate a good breakfast, packed up, and headed for the area we’d been in the night before. I had a plan for what the elk would do, where we’d be, and how it would all likely go down. However, things don’t always go as planned. I had planned to get there just as the sun was coming up, locate the elk, and move into a spot to ambush them before they arrived. One of my guides, Cougar Sanchez, was going to sit back where he could see and radio us if we lost sight of the elk. We wouldn’t be able to move too fast because Wyatt has trouble with balance, especially in rough terrain. He walks on his own and is very happy to do so, but in this terrain we would need to make sure he kept a safe pace. Keeping an eye on the elk. The first part of the plan was intact. We located the elk, and they were headed up the mountain towards the spot where I’d seen them bed down over the last several days. 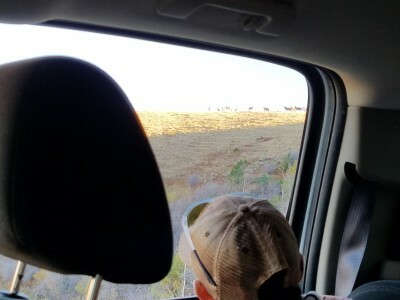 We started up the mountain to try and get ahead of them and into a spot for Wyatt to have a good shot at the herd bull. Things were still going as planned, and we probably would’ve been in good shape had we not had to skirt several red heifers I was sure would ruin the deal if we bumped them towards the elk herd. Nancy and I took turns holding Wyatt’s hand while we rerouted around the beef cows. Cougar kept me informed about what the elk were doing once we lost sight of them as we continued up the mountain. About an hour or so into our stalk, a pack of five or six coyotes decided to run through the elk, causing them to pick up their pace considerably. We were now behind the elk as they moved past their usual bedding area and onward up the mountain. 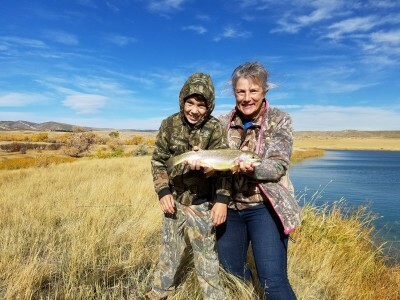 We were traveling pretty steady, but Wyatt never showed signs of weakening and was not going to give up until we either bumped the elk off the mountain or had one on the ground. Finally, Cougar radioed me and it sounded like the elk had started to settle in. We headed in the direction we thought the elk were in and played the wind to try to get into a position to shoot. When we arrived at the rock where I wanted to shoot from, the elk had moved off just enough so that we had to keep climbing and move towards another vantage point while keeping the inconsistent crosswind in our favor. It had been well over two hours of hiking now, and Wyatt had made it about four times as far as I had anticipated him having to go. He never weakened once. As we made our way to the next little outcropping of limestone rock, I could see the heads of a few cows and the big bull. We were within 250 yards and needed to crawl about 30 more so we could set Wyatt up on a pack to shoot over the mahogany brush. Wyatt followed me as Nancy and Jimmy stayed back. Along on the hunt was Gene, who was filming Wyatt’s hunt for a T.V. show the Outdoor Dream Foundation was producing. Wyatt, Gene, and I crawled the 30 yards, and I set my pack on the tallest rock and got Wyatt’s gun set up for him. Gene was in position behind us as Wyatt settled in to find the bull in his scope. He was 220 yards from us and standing broadside, but there were cows all around him, so we didn’t have a shot. Wyatt waited patiently for the bull to become clear of any cows. After several minutes, the bull finally stepped away from his cows and was alone in Wyatt’s scope, but his rump was our only target. We waited until the bull finally stepped around and presented Wyatt with a slight quartering away shot. When Wyatt shot, I could see that he had hit the bull, but I couldn’t tell where. I helped Wyatt chamber another round, and the bull dropped when he hit him the second time. What an emotional moment for each of us involved up there and for the guys down the mountain watching the whole thing through their spotting scopes. Wyatt had done it just as I knew he would when I met him. As Nancy and I took turns helping Wyatt up the mountain, we kept asking him how he was doing and if he needed a break. He never once said yes to a break. I get a little emotional thinking back to that hike up the mountain. As I look at my kids running around, playing, fighting, laughing, and crying, I realize how blessed I am in many aspects of my life. I have a fantastic wife, Dee Ann, and healthy, energetic, and loving kids, Brooke (4) and Tanner (6). I was raised in a good home with much love and support. I also get to live a dream while working in the outdoors as a professional outfitter for a great ranch in Wyoming. I can’t begin to express my passion and appreciation for what I do and that I’m able to raise my kids in such an environment. Watching Wyatt and his dad hug on the mountain was worth everything, and I’m glad to have been a part of that moment. As we walked up to the bull, Wyatt let out a high-pitched scream and made his way over to his dream bull. We high fived, took pictures, and hugged in celebration as the rest of the guides and a couple of our antelope clients made their way from the vantage point below to congratulate Wyatt and help me quarter and cape the elk. We got the bull off the mountain and down to the trucks to end an especially rewarding day. We spent the rest of the week glassing for elk, fishing, shed hunting, riding horses, and relaxing. My son, Tanner, came out one day to hang out with Wyatt and harass him as much as possible. I truly hope that I get to share more experiences like this in my lifetime. I feel lucky to have met Wyatt, Jimmy, and Nancy and to get to use what I do every day to help make a dream come true.